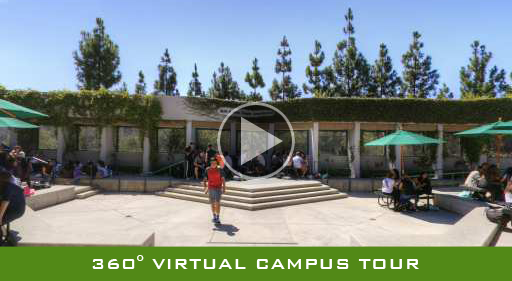 Milken is situated on a picturesque, 11-acre campus in the Santa Monica Mountains along the Mulholland corridor. Our state-of-the-art technology includes a high-speed fiber-optic network, advanced science labs, a broadcast studio, a multimedia center, and student work areas. To support the school’s commitment to transforming the power of educational technology, all classrooms are equipped with the latest in digital and video technology. Milken is a "1to1" learning community, using MacBooks across the curriculum. Whether eating lunch, conducting a club meeting, raising awareness for social action, or performing a poetry slam or impromptu concert, both the Middle and Upper School campuses have outdoor amphitheaters that serve as community gathering places. The Milken Mart on the Upper School campus and Middle Mart on the Middle School campus offer an array of food options from quick breakfasts and lunch to snacks and drinks. Both marts are staffed by dedicated parent volunteers and serve as a place for students to congregate and parents to connect with the Milken community. In addition to being open in the morning and at lunchtime, Milken Mart is also open from 2:00PM to 3:00PM, Monday through Thursday, for students who remain on campus for after school activities. The Esther and Sol Smith Family Library actively fosters a love of teaching and learning within the School’s community of students, teachers, administration, staff, and parents. 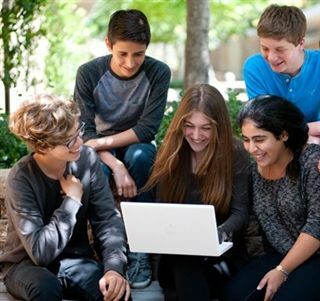 The Library serves students in grades 7-12 by offering traditional, secular, and Judaic print and electronic resources, keeping these collections current, and making them readily available to our patrons. Ensures that students become independent, lifelong learners by supporting their research efforts. Enables patrons to access the most recent and reliable print and electronic resources and offers training in the use of these materials. Provides a rich source of cultural programming, hosting student writing, drama and music productions, and art displays. The Middle School Community Room, a central hub for activity on the Middle School campus, is a transformable multipurpose space that is used daily by students in a variety of capacities. The community room features a full service kosher kitchen that provides daily lunches to many of the students in our community and has served as a preparation area for service learning projects and community events. The main room gives students a space to be together during free periods of the day such as lunch and nutrition, as well as full community gatherings like our t’fillah services, holiday celebrations, and town meetings. The state-of-the-art audio/video system provides students the platform to share movies and presentations that they create with their community, and allows teachers, administrators and guest speakers the opportunity to give dynamic presentations to large groups. On days where the glass doors of the community room are opened up into the Welcome Plaza and the music from inside can be heard, the campus feels like the streets of Tel Aviv. Milken offers bus transportation from 5 routes in the LA area: Wilshire Boulevard (East and West), Ventura Boulevard (East and West), and Sunset Boulevard. Bus transportation offers families a solution to L.A.'s traffic congestion and aids in alleviating city zoning concerns. More importantly, it saves you time. Bus transportation service is offered for the school year for one way, round trip, and one day passes. The cost for this service is $1,315 for round-trip and $795 for one-way service. This price covers the student for the entire academic year. As space is limited to the number of seats on each bus, reservations will be on a first-come, first-served basis. Afternoon buses depart at 3:45 PM Monday through Thursday, at the conclusion of the Lishma period, and on Friday at 2:45 PM. Also, in consideration of extracurricular activities and athletic games and practices, late buses departing at 6:00 PM are also available.